If you exceed your monthly mobile data limit, your cell phone bill can skyrocket pretty quickly. This is why a lot of people vigilantly monitor internet usage and even uninstall apps that use too much background data. Up until now, you couldn't selectively block an app's internet traffic on Android without being rooted, but thanks to some innovative work from developer Marcel Bokhorst, this has finally changed. 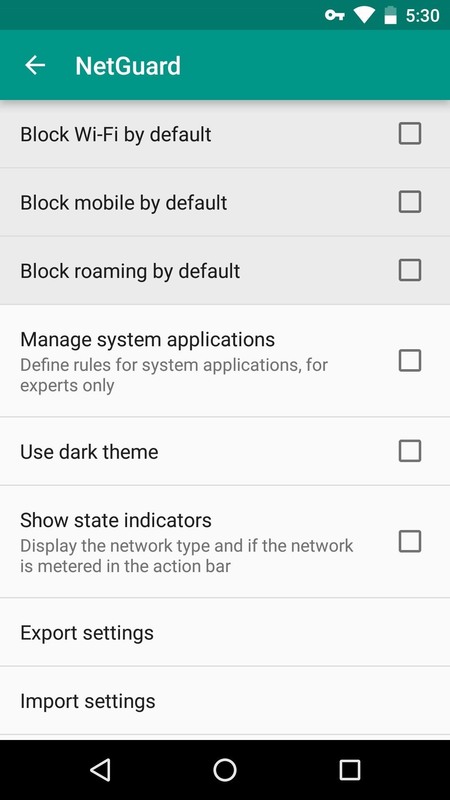 His latest app allows all users running Android 5.0 Lollipop or higher to prevent any app from accessing the internet and sucking up your mobile data, and I'll show you how to set it up below. 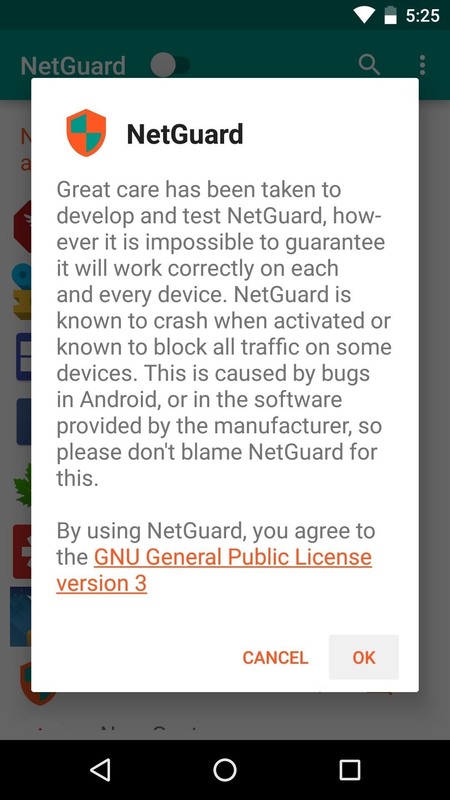 When you first launch NetGuard, you'll be greeted by a disclaimer, so press "OK" on this message. From here, toggle the switch at the top of the screen to enable the NetGuard service. 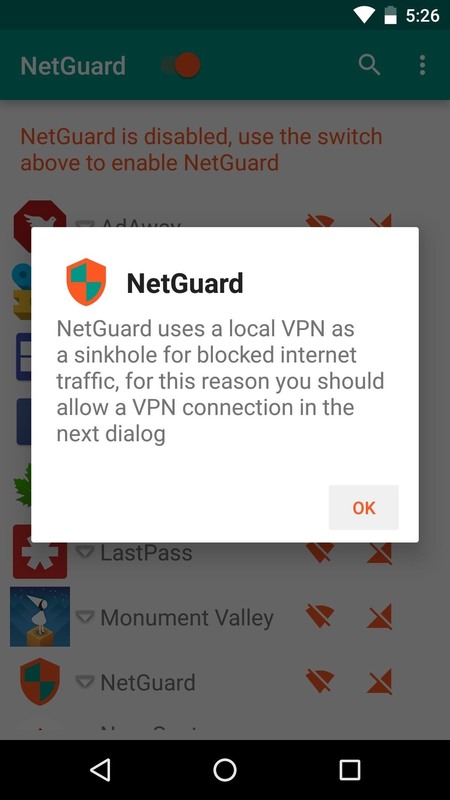 Next, you'll be informed that NetGuard uses a VPN to selectively block internet traffic to and from apps, so press "OK" on this message. 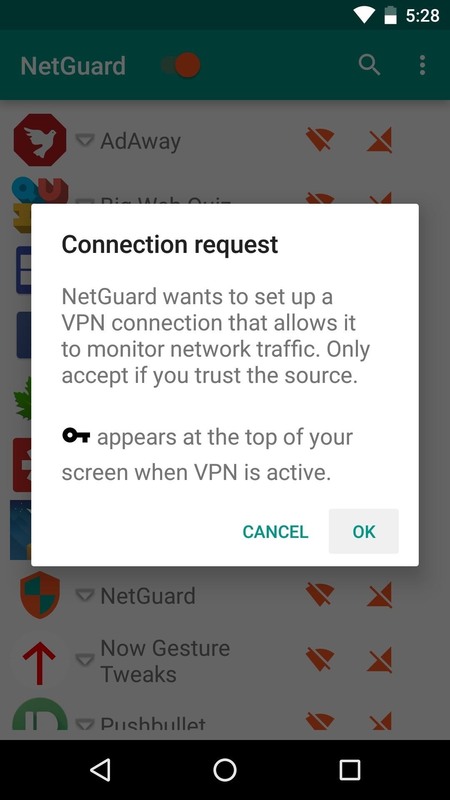 From here, you'll be prompted by Android to allow NetGuard to connect to this VPN, so press "OK" on the second popup as well. Once the NetGuard VPN is active, you'll see a small key icon in your status bar. Any time you see this icon, NetGuard is active, so you're all set to go. 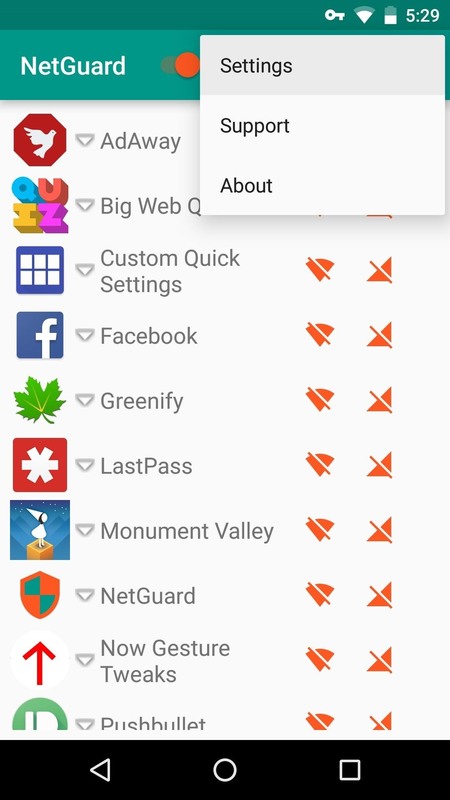 By default, NetGuard blocks all types of internet traffic from all of the apps you installed on your phone, and you can then go back to selectively enable data connections after the fact. If you'd rather this be the other way around—meaning traffic will be allowed by default and can be selectively denied—tap the three-dot menu button and head to "Settings." From here, deselect the first three options if you'd like to allow traffic by default but restrict it selectively. Then, if you'd like to be able to manage traffic from pre-installed system apps as well, tick the box next to the fourth option. Regardless of the settings you chose, NetGuard makes it simple to block internet traffic to and from any app. 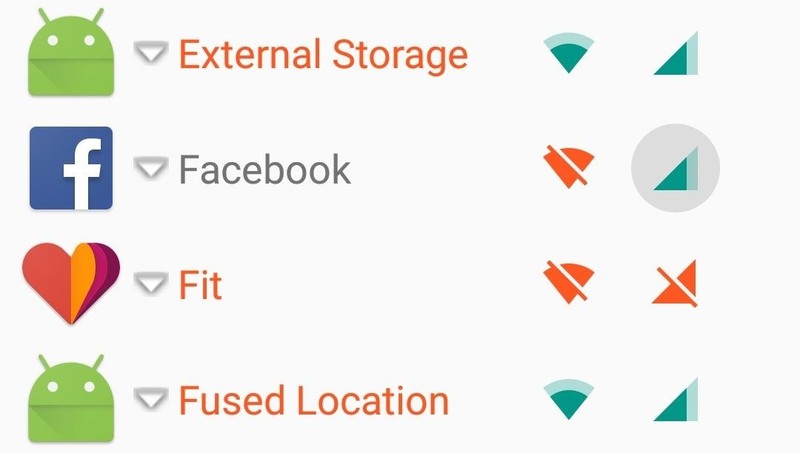 Next to each entry in the list on the app's main menu, there are two icons—the first is for Wi-Fi, and the second is for mobile data. To block or allow traffic to any app, simply tap either of the icons next to an entry. When the icon is orange, that means that type of internet traffic will be blocked—whereas a green icon means that internet traffic is allowed. 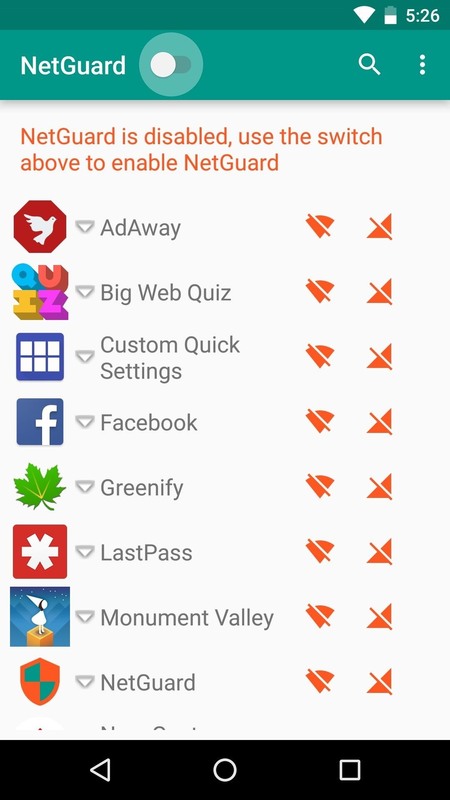 What apps have you blocked using NetGuard? Let us know in the comment section below, or drop us a line on Android Hacks' Facebook or Twitter, or Gadget Hacks' Facebook, Google+, or Twitter. This is a great idea! Thanks for letting us know. it uses VPN?? which server and how safe is this? So basically it reroutes all your connections thru the program, and only allows explicit traffic to go out. It is as much safe as you trust an application to potentially intercept all your network traffic, but given this project is open source you can see and compile the code yourself and make sure no rogue addition is made. It is not good. I have an Asus phone and it says it is not compatible with my phone.